In the following case study, DSF Member, BrightSign, LLC, describes an innovative and eloquent installation at the Leo Baeck Institute in New York. The creative force behind the “Stolen Heart” exhibition, DSF Member C&G Partners, track the rise of Jewish business and property owners and their contributions to Berlin’s central district, Mitte, until the 1930s, after which state-sponsored Aryanization” resulted in the destruction and theft of Jewish-owned properties. 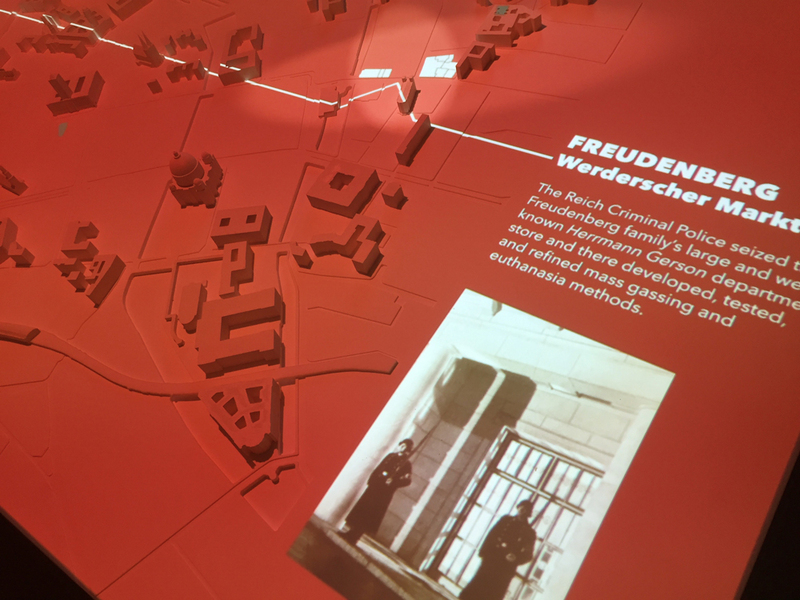 The Stolen Heart Video Map is the signature element of the small but impactful exhibition “Stolen Heart: The Theft of Jewish Property in Berlin’s Historic Center, 1933–1945.” The exhibition and three-dimensional projection map designed by C&G Partners tracks the theft of Jewish homes and business by the Nazis during the Third Reich in Berlin. Stolen Heart follows the rise of Jewish business and property owners in Berlin during the 19th century, as well as the crucial economic, cultural, scientific and philanthropic contributions they made until the 1930s, after which Jewish owned homes and business were confiscated and used by the Nazis for various war-related purposes. BrightSign 4K media players are used to drive media elements throughout the Stolen Heart exhibition. 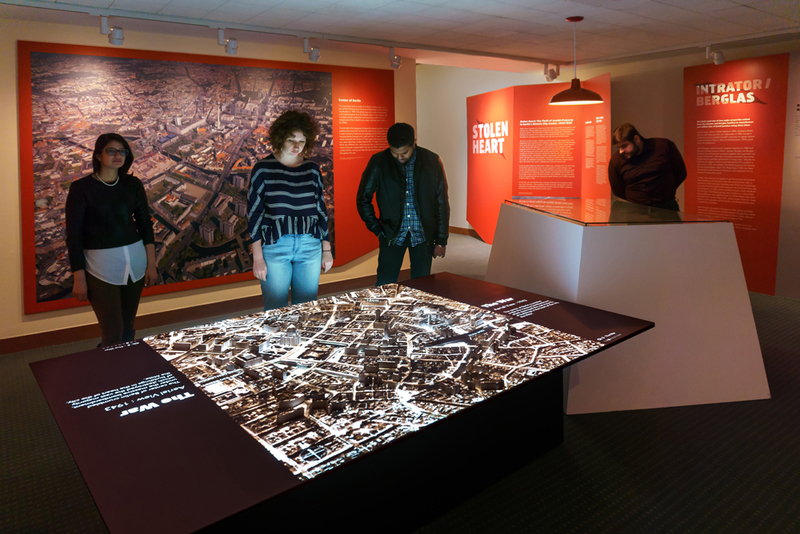 Powered by a state-of-the-art BrightSign 4K1142 player, the 3D projection-mapped video table that illustrates the expropriation of Jewish property during the Third Reich in Berlin is the centerpiece of the exhibit. 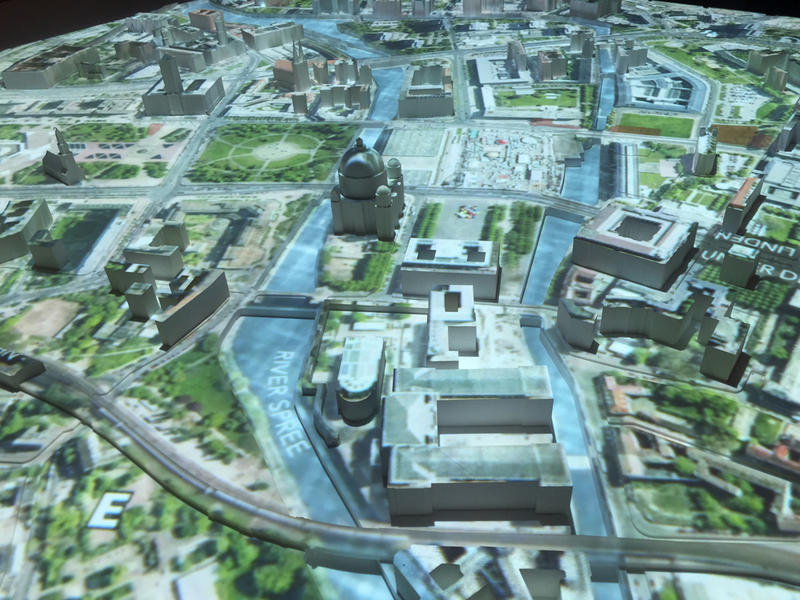 The maps feature aerial views of homes and other properties from 1933 to present day, with video content incorporating archival images and topographic time-lapse elements projected onto the 3D-printed 1:1,500 scale model of the heart of Mitte. The projection-mapped effects, including tiny details like moving period-automobiles, were prototyped at actual size throughout production using BrightSign equipment in testing. The design team is especially grateful for the “set it and forget it” nature of BrightSign’s products. In addition to scheduling functions that simplified operations for the client, the players proved to be more economical and sustainable compared to other PC-based options. The exhibit design and content was further augmented by the products’ stellar HD video quality, precise alignment and synchronization. The expropriation narrative is illustrated through five prominent Jewish families whose Berlin properties were seized. 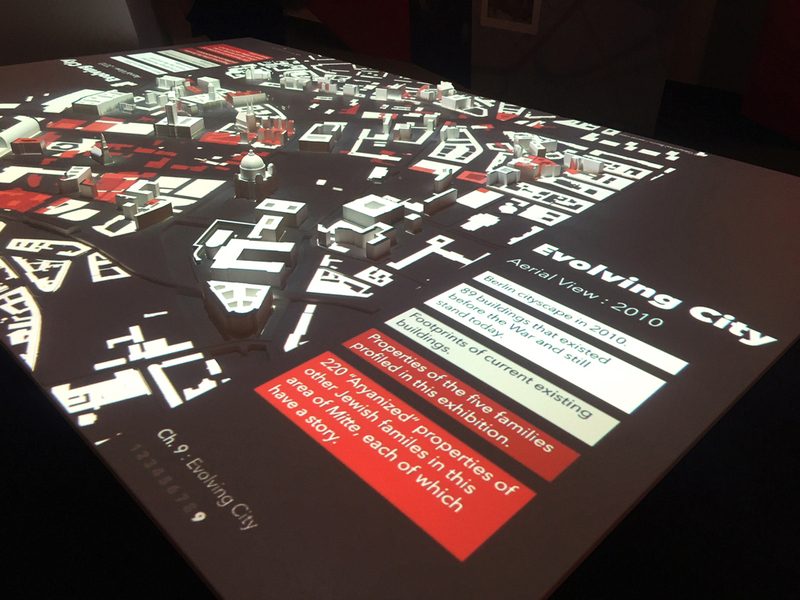 The looping video portion of the map features the homes and properties in context with historically accurate, aerial views of Berlin’s city center from 1933 to present day, with each era receiving a distinct graphic treatment. The narratives of the five families are woven into the video map through archival images and texts. Topographic and time-lapse elements mix with stylistic color tints and a custom musical score to create a somber yet inspiring mood. Printed on CNC filigree, the relief map was based on extensive architectural surveys that demarcated pre-World War II buildings. The installation has been extremely well received and has been viewed thousands of times each week by Institute visitors. Covered extensively by the press including The Wall Street Journal and The Forward, the exhibition was accompanied by a series of related programs that drew an overflow of crowds. Extremely positive experiences were reported by visitors that included individuals with expertise on the topic and in exhibition planning and design. The Stolen Heart video map was the most ambitious technological solution the Leo Baeck Institute has ever accomplished.